Best kale dish and super easy too! 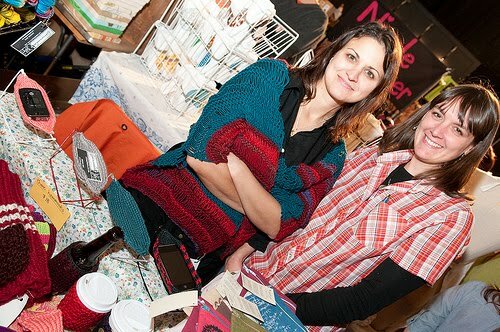 This recipe comes from my crafting partner in crime Jay (pictured* with me at our 2009 Detroit Urban Craft Fair booth). I was kind of a kale freak this summer, but never really found the perfect recipe. This one sounded sooooo good when Jay told me about it, I asked her to pass it on. Here it is! • Saute shallot, almonds and cherries in a little olive oil until shallots are soft. • Add kale and toss around until wilted. sprinkle with salt and pepper and a little lemon juice or vinegar. Entry filed under: Main Dish, Side Dishes. Tags: Recipes, vegan, vegetarian. The return of the blog: Italian Eggplant Ragout	WOOL AND WATER: Mmmmm Lentils…..